Yay for another traditional Canarian recipe! There is a staggering lack of recipes from the Canary Islands on this blog, don’t you think? Whilst some of them are quite scary – like whole deep-fried octopus – some of them aren’t quite as out-there – like this Russian salad. This is one of my ultimate favourite Canarian dishes and like many recipes around here, this one varies according to who you’re asking. Most of the times I’ve seen Russian salad in tapas bars and restaurants, it’s been loaded with mayonnaise. I mean really loaded. Like 1 potato to 3 cups of mayonnaise type of loaded. Although not quite as authentic, my recipe is certainly healthier and tastier to my opinion, since it replaces mayonnaise with yoghurt. If there is an ingredient in the list below that you don’t like, you can easily skip it or replace it with something better – it’s completely up to you. The potato and mayonnaise/yoghurt base makes this dish super-versatile and allows you to put whatever you want in it really, so go ahead and make it your own! I’m going to pre-empt you with the whole tuna weirdness. It’s not very often you incorporate tuna into a side dish and serve it alongside meat and stuff, right? But believe me, it works. I don’t know why, but it just does. 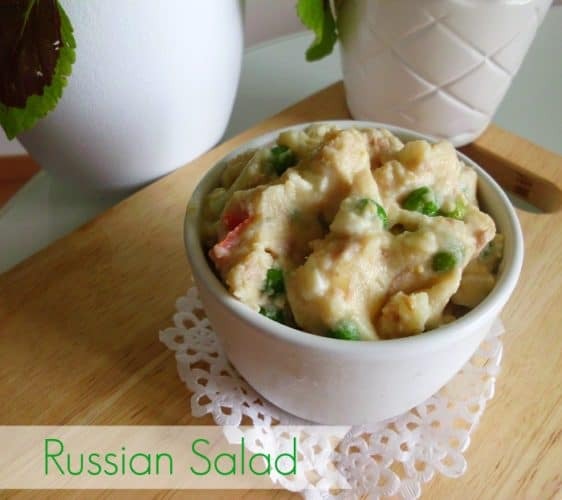 As well as being a great side dish, this Russian salad is also wonderful on it’s own for lunch or with a side of freshly-baked white baguette. Yum! Just a small recommendation – you should totally double or even triple this recipe! When I make it I always make extra to keep in the fridge so whenever I’m feeling peckish – pretty much always – I know there’s always a great snack sat in the fridge just waiting for me to devour it from the container with a spoon. Place the potatoes in a pan of water and cook over a medium heat until soft and mashable - about 20 minutes. Get another pan of water ready on the hob and pop the eggs in. Boil them until they're hard boiled - however long this is in your kitchen. Chop up the onion and red pepper and lightly fry them in a frying pan over a medium heat. When the potatoes are cooked, drain them and mashed them up. When the eggs are cooked, peel the shells off and crumble the eggs into the potatoes. Mix them in well. When the pepper and onion are cooked, toss them into the potato mixture and mix well. Tip in the yoghurt and stir well. Taste test and if it's too dry, add more yoghurt. Leave to cool to room temperature before storing in an air-right container in the fridge. Well, this is a new one on me! Never even heard of this before, but love the way it looks. All of the ingredients I have on hand and may just try this today!!! The tuna does make it different but I can imagine how good it is. I am glad you shared this with us at My Meatless Mondays.